2019 Volvo S60 is first model from automaker’s new plant in Charleston, SC. SANTA MONICA, CA – The all-new 2019 Volvo S60 represents the apex of the Sweden-based, Chinese-owned luxury brand’s renaissance since being jettisoned from Ford 10 years ago. The complete makeover that’s based upon Volvo’s Scalable Product Architecture (SPA) and a series of highly efficient 4-cyl. engines started with Volvo’s volume-leading XC90 SUV in 2014, continued through Volvo’s entire vehicle line and is completed with the ’19 S60. The sport sedan – the first Volvo model completely built in the automaker’s new plant in Charleston, SC – benefits from the refinements applied to previous vehicles in its revitalization by Chinese owners Xhejiang Geely. The S60 needs every advantage it can get to compete in the midsize luxury sports sedan segment dominated by the Audi A4, BMW 3-Series and Mercedes-Benz C-Class. According to Wards Intelligence data, Volvo S60 sales have steadily declined over the past five years – from a high of 25,447 in 2014 to 16,823 in 2017. And far behind the 31,453 A4s, 59,449 3-Series and 77,447 C-Class vehicles sold in 2017. But with its longer, lower, and narrower stance, sleek new sheet metal, more horses under the hood, elegantly understated interior, enhanced tech and even a limited-edition plug-in hybrid powertrain, the third-generation S60 has a shot at challenging the German power trio. The ’19 S60 can be outfitted with three different 4-cyl. engines, all mated to an 8-speed automatic transmission. The base T5 gets a 2.0L turbocharged powerplant that sends 250 hp to the front wheels. The T6 adds supercharging on top of the T5’s turbo for an output of 316 hp and the 8-speed gearbox powers all four wheels. The T8 supplements the T6’s powertrain with a plug-in hybrid electric system for a combined output of 400 hp and an electric-only driving range estimated at 21 miles (34 km). The S60 T5 and T6 come in three trim levels – Momentum, R-Design and Inscription – while the top-of-the-line T8 PHEV has an exclusive Polestar trim. We tested the T6 R-Design AWD that starts at $47,045 and comes with abundant standard features and an exclusive R-Design grille, gloss-black lower window trim and sideview mirror covers. 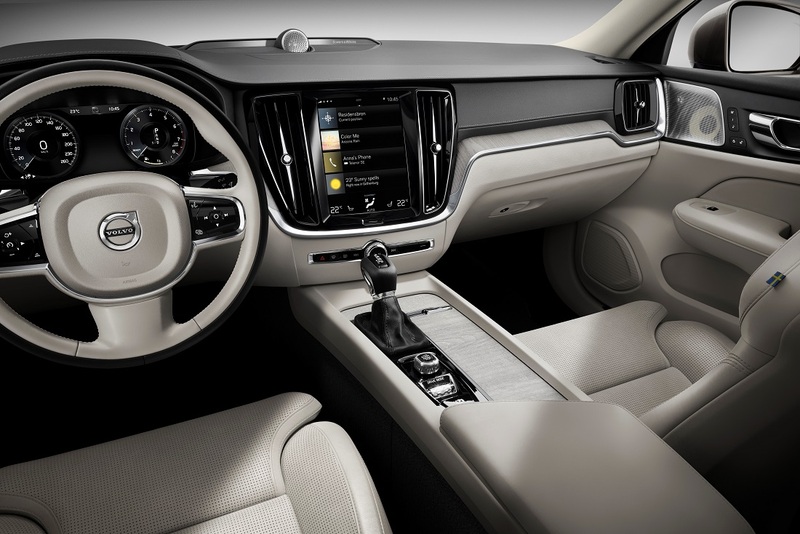 Other standard exterior features include door-handle illumination, fog lights embedded in the front spoiler and LED headlights with auto high beams and Volvo’s signature “Thor's Hammer” daytime running lights. Inside the T6 R-Design comes with dual-zone climate control, a panoramic moonroof, sport seats, driver and front-passenger seat memory settings, heated front seats, power folding rear seats and rear-seat headrests and an R-Design steering wheel, gearshift knob and pedals. Standard tech amenities include the Sensus Connect infotainment system with a 9-in. (23-cm) vertical touchscreen, navigation, Apple CarPlay and Android Auto capability, a 12.3-in. (31-cm) digital instrument cluster, 13-speaker Harman Kardon Premium sound system, head-up display, leather upholstery and the Volvo On Call telematics system with a remote app. The T6 R-Design receives a full complement of standard driver-assist features: front and intersection collision mitigation (with pedestrian, cyclist and large-animal detection) run-off road protection, lane-keeping assist, a road sign reader, oncoming lane-collision mitigation, blindspot monitoring with cross-traffic alert, drowsy driver monitor, post-collision braking and adaptive cruise control with Pilot Assist semi-automated driving. Whether sprinting to merge into LA-area freeway traffic or climbing rural canyon roads, the T6 R-Design’s turbo- and supercharged 316-hp 4-cyl. propelled the car swiftly and effortlessly. Shifts from the Geartronic 8-speed automatic transmission were smooth, while a manual mode and steering-wheel paddle shifters allow the driver to control shift points. The T6 R-Design handles curves at speed with competency matching that of its Teutonic rivals and feels planted, thanks in part to the grip provided by the all-wheel-drive system. While steering feedback is a bit dull, the smaller-than-average steering wheel adds a sportier feeling. The exhaust note is discreet but with enough feedback and growl to clearly communicate the car’s performance prowess. On the freeway and surface streets, the ride was smooth in Comfort mode, with the suspension easily absorbing bumps even while cornering. The cabin is quiet, and wind and road noise are minimal even at highway speeds. The S60’s interior follows the subtly stylish design of the rest of the Volvo line. The R-Design's sport seats provide a bit more bolstering compared with other Volvo vehicles to keep the driver and passengers stable even during aggressive cornering. Overall outward visibility is first-rate, and we like that the rear-seat head restraints fold at a touch of a button for an improved rearview. The Sensus Connect infotainment system’s 9-in. portrait-oriented touchscreen has the four-tile main menu found in other recent Volvos but was updated for the ’19 S60 with 50% greater processing power and better voice control. It’s a visually attractive interface, but even after testing it in multiple Volvo vehicles we still don’t find it as intuitive as some competing systems. While response to inputs is faster than previous Sensus systems, the interface still can lag and requires a more forceful finger press than with other touchscreens. Certain touchscreen functions, such as for the heated seats, would be much better – and safer – to use if they were knob-operated. Volvo Pilot Assist is one of several semi-autonomous systems offered by luxury OEMs that essentially are adaptive cruise control combined with a lane-keeping technology but require attention on the part of the driver or the system will turn off. We’ve tested several such systems on the highway and Volvo Pilot Assist is our least favorite, because it struggles to keep the vehicle centered in its lane and we often feel it fights against driver steering inputs. True to Volvo’s long tradition of being in the vanguard of vehicle safety, the S60 offers cutting-edge driver assists such as large-animal detection and oncoming lane collision mitigation. Surprisingly, we experienced several false alarms from the forward-collision warning system that triggered brief but startling emergency autonomous braking. 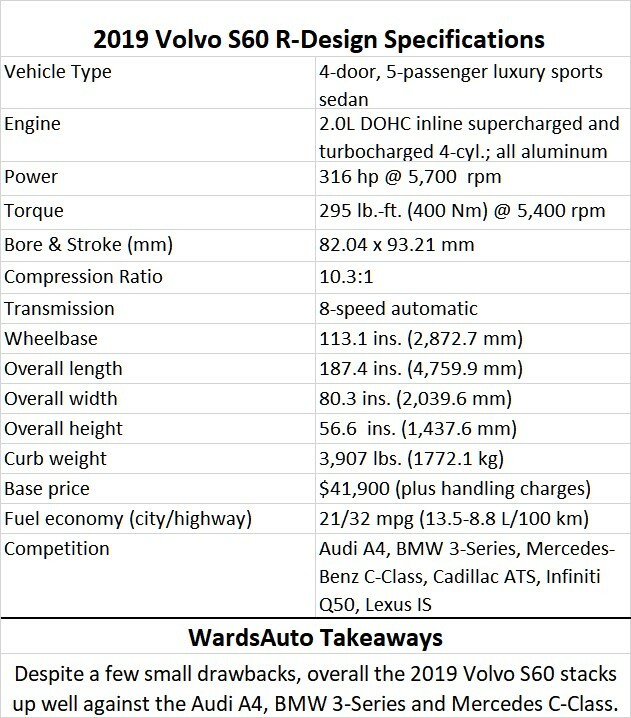 Despite a few small drawbacks, overall the ’19 Volvo S60 stacks up well against the A4, 3-Series and C-Class. Its impressive performance is on par with those segment leaders, and its larger and attractive new exterior and tasteful Nordic-design interior makes it stand out among its respected rivals. The S60 completes Volvo’s comprehensive revamp on a high note. That it’s manufactured in the U.S. could give it an edge among American car buyers in the luxury sedan segment.